Our Technical team soon realised as good as the Pure Air, (Little Brother to the KoolKat system) is, clients were also asking if we had something a little bigger in cooling output yet was still a split system design. Welcome to the KOOLKAT a Full 134A refrigerant, Electric Cooling System, with a powerful 12000 BTU of output. 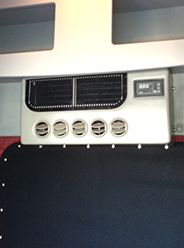 The Koolkat system is designed for sleeper cab environments, which are larger than a standard sleeper option. (I.E large cab Kenwoth). The system has an impressive output of up to 12000 BTU, this unit is sure to impress the client wanting to also up-grade in Performance & Budget, from the Pure Air Electric cooling system. Our KoolKat system comes standard as a split system installation, with the Condenser assembly mounted to the External rear wall & Evaporator mounted to the Internal rear wall. With a full remote control function and climate control fan speed adjustment, the operator is in control. KoolKat is 12 or 24v & designed to run from standard kit supplied deep cycle batteries with a built in low voltage sensor/shutoff. Run time is approx. 4 to 7 hours, subject to battery age and external temperature & application factors. 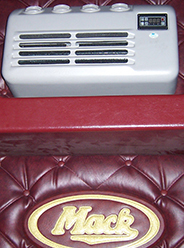 Choose our KoolKat System, if you sleep in your truck most nights of the week, you have a large area to cool, you are a fleet operator, budget conscious & have tried the Evaporative systems and want to up-grade to an Electric Refrigerant cooling system, without the next step of Diesel powered motors. Although relatively new to the Market, Our Koolkat System easily command’s industry respect with awareness & acceptance around Australia, we consider this system one level below our top of the range Diesel Powered cooling system “The Ecowind”.